So delicious, and easy to make with just 6 ingredients! Perfect appetizer too!! 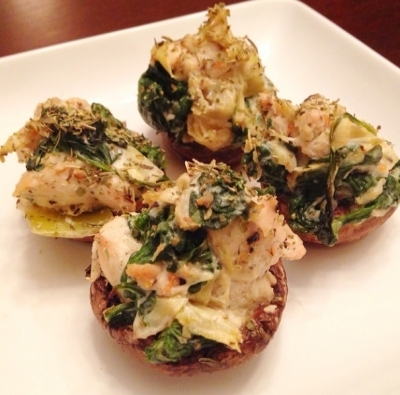 Ingredients (3 servings): 1 large chicken breast, 1/2 cup cooked spinach, 1 small jar cooked artichoke hearts, 1.5 tbsp. nonfat plain Greek yogurt, 1 tbsp. Mrs. Dash garlic seasoning, 12 mushrooms. Directions: Bake chicken on 350 for 25 minutes (season with 1/2 tbsp Mrs Dash). Let cool and dice finely. SautÃ© spinach and artichokes in greased skillet for 5 minutes, then mix in bowl with diced chicken, Greek yogurt, and other 1/2 tbsp. seasoning. Gut mushrooms (I placed in mini muffin pans so they wouldn't tip over), stuff with mixture, and bake on 350 for 8-10 minutes!